Said to be t he first and oldest illustrated book on Christianity, the Garima Gospels ﻿was discovered in a monastery in Ethiopia. Written in the form of a gospel in 494 AD, its colors and bindings are still intact. 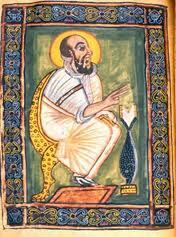 The author, a monk named Abba Garima arrived in Ethiopia from Constantinople in the fifth century. Legend has it that he wrote the book in one day.